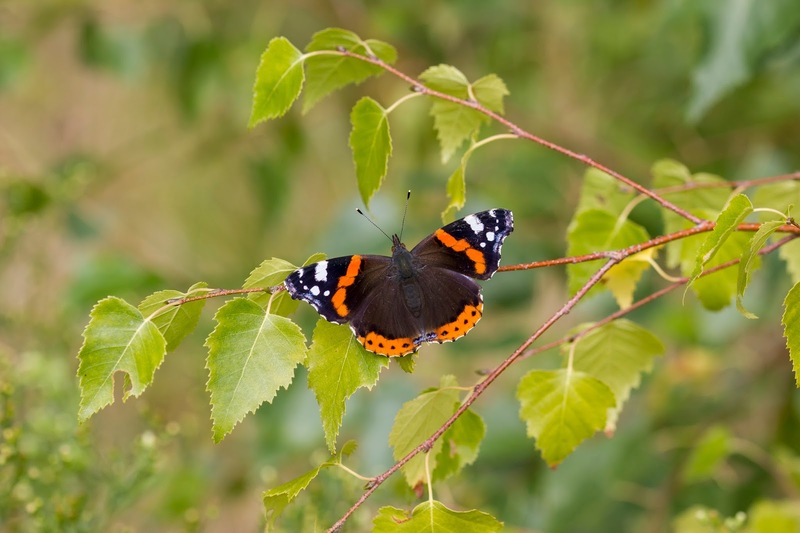 As late summer merged into an unseasonally warm autumn Salcey Forest continued to produce some great butterflies. It's been very enjoyable to concentrate most of my wildlife watching efforts at this site this year and I am already looking forward to next year's butterfly season! This brief post will finalize the end of the butterfly season within the woodland. 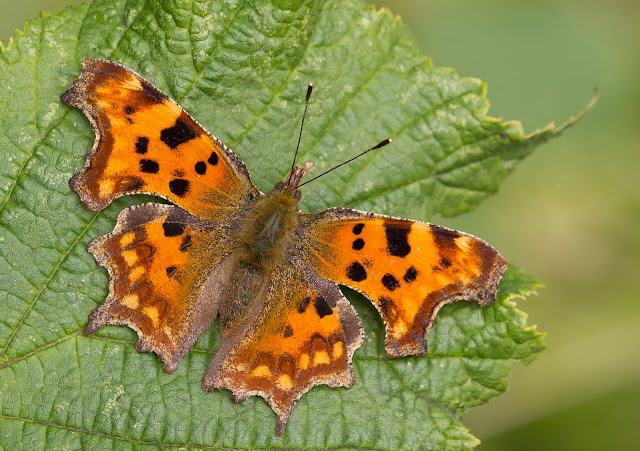 As the daylight hours slowly dwindled we were lucky enough to have some good spells of sunshine and the butterflies certainly seemed to take advantage of it. One of my favourite sightings of the late summer was a single White Letter Hairstreak down in the motorway meadow but this will be covered in more detail at the end of this post. The grassland strip by the solar farm and the clearings dotted around the rides to the north played home to some very nice looking Blues and Skippers. 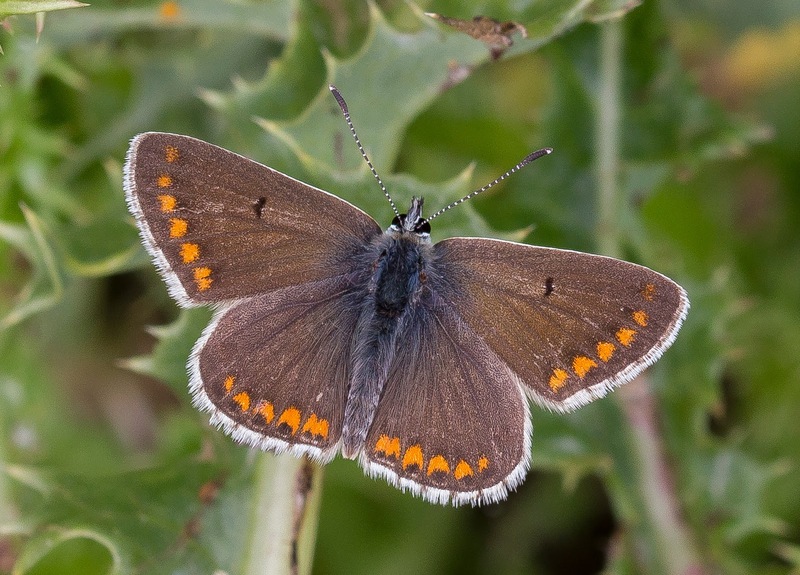 Lots of Common Blues could be seen during August and also quite a few superb looking Brown Argus. 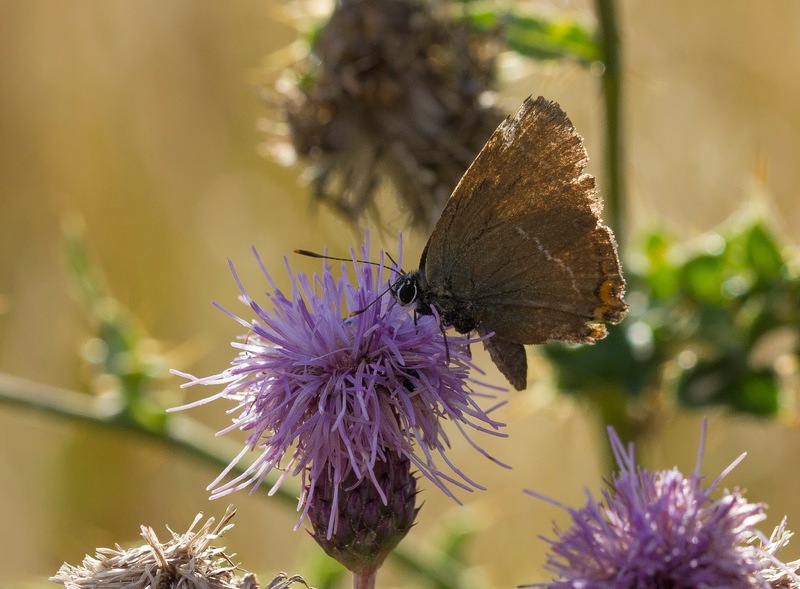 Large, Small and Essex Skippers took advantage of the long grasses by the solar farm and the Whites enjoyed the nectar sources in the area too as Large, Small and Green Veined White were prolific during August to late September. Small Copper seemed to be easier to find during their second emergence and once again the solar farm played host to most of the sightings. One particularly small specimen was seen down in the clearing south of the Horsebox car park and during one evening visit seemed to settle nicely for photographs which I certainly took advantage of. The usual late Nymphalidae and Brimstones could be seen in the forest flying late into the season, well this was if you knew where to look. I'd stumbled across a late flowering Buddleia in a clearing and I gave it a lot of attention especially when time was limited. Some days in the early afternoon the Buddleia's branches were almost bowing with the Red Admirals, Commas and Brimstones! One afternoon while enjoying the spectacle of so many butterflies feeding in one place I had an unexpected visitor in the shape of a Hummingbird Hawkmoth. 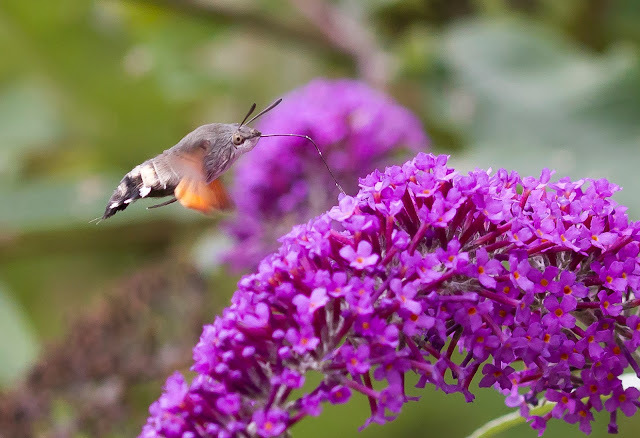 It shot in like a rocket and over the course of 10 minutes or so seemed to visit every flower head on the bush before shooting off with as much speed as it arrived! I did manage to keep up with it for some shots though but perseverance and constant setting changes on the back of the camera were definitely needed! 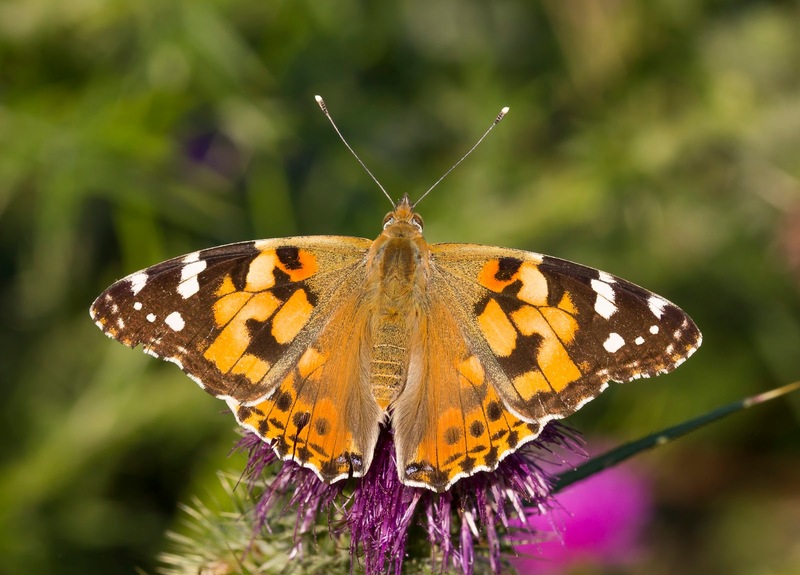 Some of the young from the earlier Painted Ladies had also started to emerge and one morning I stumbled upon this beauty sunning it's self at dawn. Other sightings within to woodland concerned the Hairstreaks. 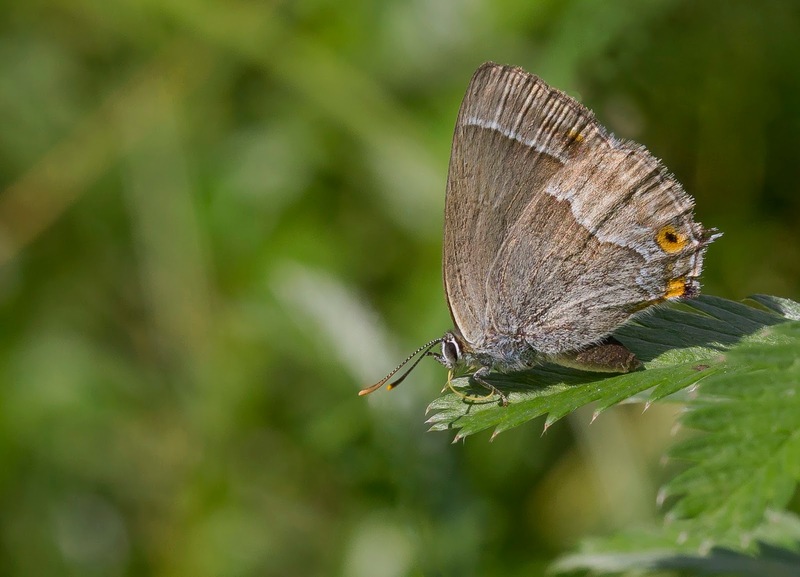 Purple Hairstreaks were seen all over the site with the best areas being the north ride near the solar farm, the ride south of the Horsebox car park, the area over the road from the main car park and the ride running north of the motorway meadow. It was great to watch them during evening after work visits and I was lucky enough at one point to have one down on the ground but just as I was about to get a photo a flipping fly came out of nowhere and attacked it sending back up high into the canopy! 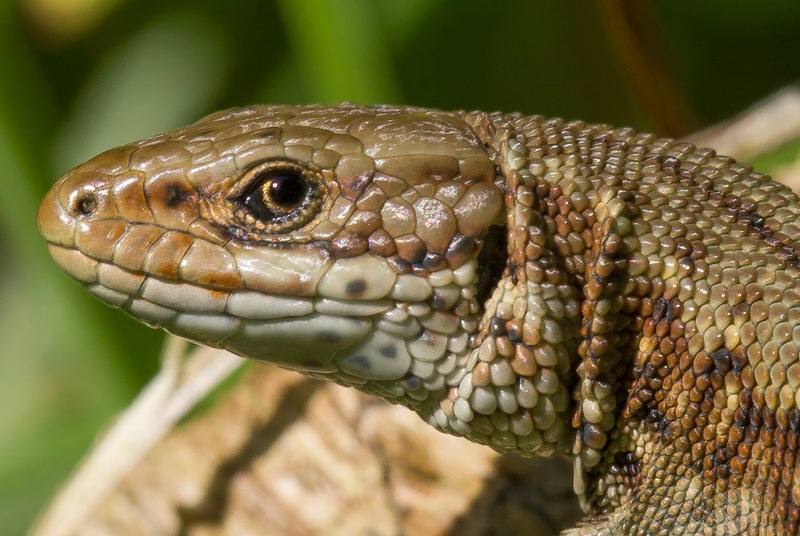 During one of my many visits to the south side I also found a new spot for some of the other spectacular site specialities, these being the great Common Lizard population. As I wandered down ride near the motorway meadow I noticed a tiny little face peeking out of the undergrowth during the midday sun. I managed to find at least three Common Lizard in the area and after a bit of stealth and patience (and a lot of funny looks from a group of passing joggers) I got some shots. At the beginning of August as I had a quick after work walk in the meadow I saw a little butterfly whirling around the Thistle heads. 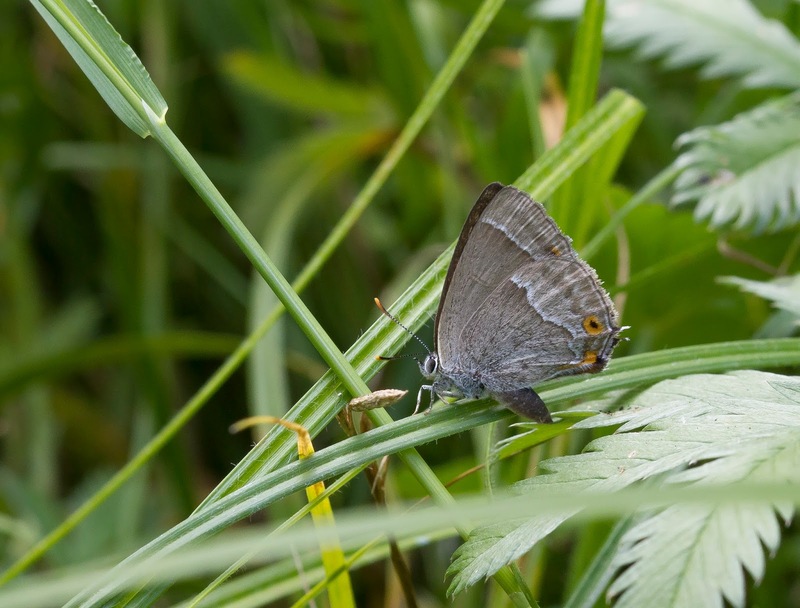 I waded through the grass and was amazed to find a very tatty White Letter Hairstreak. As far as I am aware the White Letter Hairstreak has never been common in the forest and although the odd annual report of one normally comes in not much is know about them. I got a couple of shots and rang Doug Goddard the county recorder of my find. 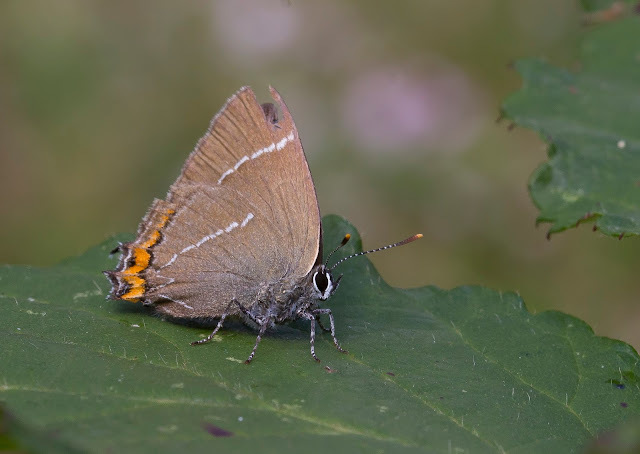 It's never good to admit to favourites as of course all of our wildlife is special but I have to admit I've got a real thing for Hairstreaks so I set myself the ridiculous challenge of trying to find where this butterfly must have come from. 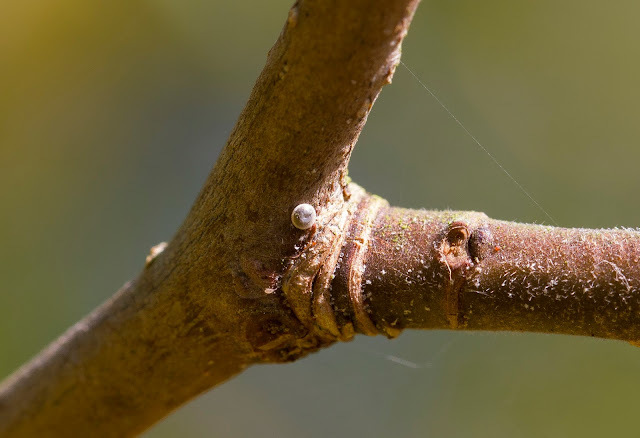 During November, as the weather turned more autumnal and the leaves slowly disappeared from the trees I started to search the Elms in the area looking for White Letter Hairstreak eggs. Believe me this is far easier said than done! On my first attempt I searched and searched before finally heading back to where I'd parked the car seemingly doomed to failure. 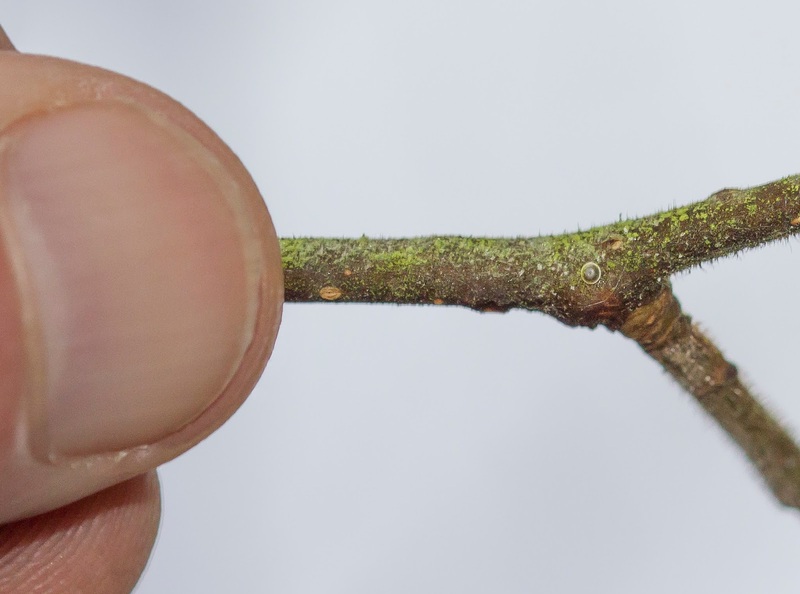 I suddenly remembered a small Elm by the roadside and went to take a look but at first glance I couldn't find any. I took a breather and tried to remember what I had to get from the shop on the way home and as I did so I looked up and saw a tiny little disc underneath one of the branches. I took a pic using the macro lens and zoomed in one the back of the camera. 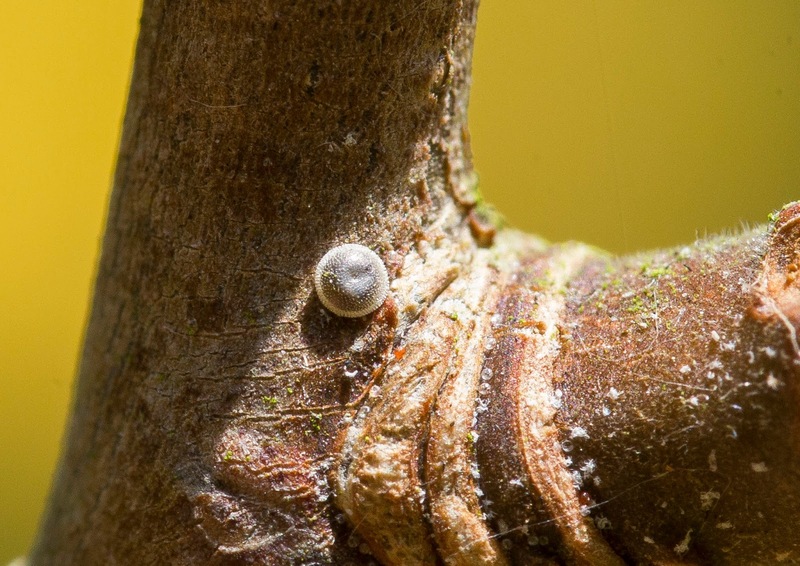 I couldn't believe what I was seeing, I'd just found a White Letter Hairstreak egg! Despite searching I couldn't find any more so went home and as I was working or otherwise committed to other things for the next couple of weeks I had plenty of time to try and work out how to be more productive in finding these tiny eggs. The biggest problem I found when looking is due to the location they like to lay - this being on the scar underneath areas of new and old growth. Consequently you're always looking up against the sky. So the next time I went I took my bright LED torch with me and this helped no end. I not only managed to find a total of five eggs but they were in two separate locations which meant I'd also found two colonies now. Here's a few of pics of the results. 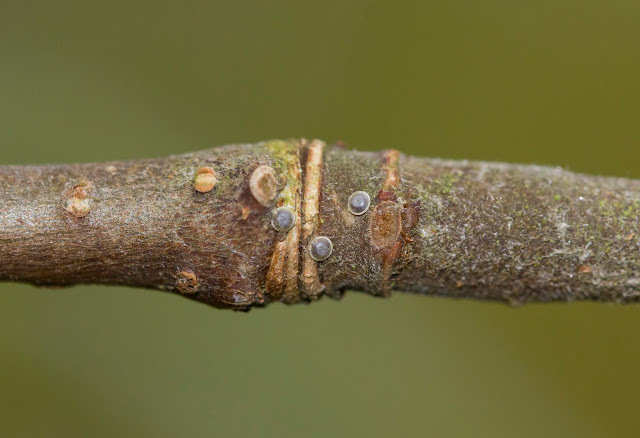 You may wonder why I've spent so much time trying to find these eggs but as the White Letter Hairstreak is a UK BAP species of high concern I thought it worthwhile. So anyway this draws to an end a rather short post. This year I've certainly learned a lot about Salcey Forest and the richness of habitat in there. It's one of those places where once you've seen the site specialites such as Wood White etc. it's very easy to dismiss it as a site of "not much there" but when you delve deep down it's amazing what you can find. Lets hope next year will be just as productive. I've been wanting to see a valezina form of the Silver Washed Fritillary for many years but they they always seemed to elude me. In my defence I hadn't looked too hard for them as I really wanted to find one of my own in Salcey Forest but as time wore on it was becoming apparent that that's easier said than done! There comes a time therefore when if you want to see something you have to travel and luckily for me I didn't have to travel far. 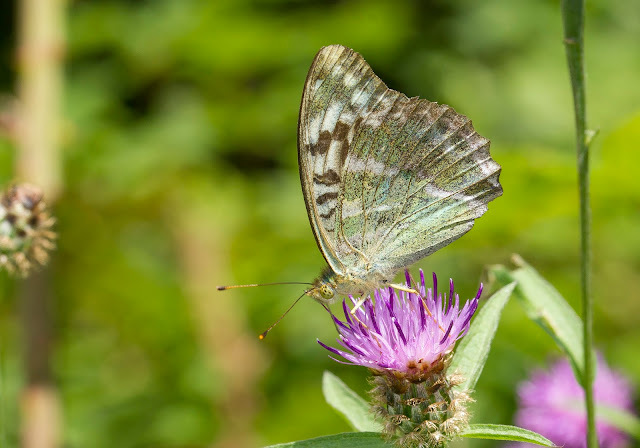 The nearby forest of Bucknell Wood has been a very good site for Silver Washed Fritillary and it often throws up a valezina for the lucky butterfly watchers who visit it. Soon after I had returned from Indonesia (see previous post) I heard a valezina had indeed made an appearance again this year so I chucked the camera in the car and headed over. I searched the area it was seen in for a while and while I did so a tatty White Letter Hairstreak descended from the trees and onto the bushes. These had been absent from the wood for a while so it was nice to see them making a return. I turned my attention to taking photos of this while waiting for the Fritillary to make an appearance. A few other interesting butterflies were also whirling about in the forest glade I found myself in. 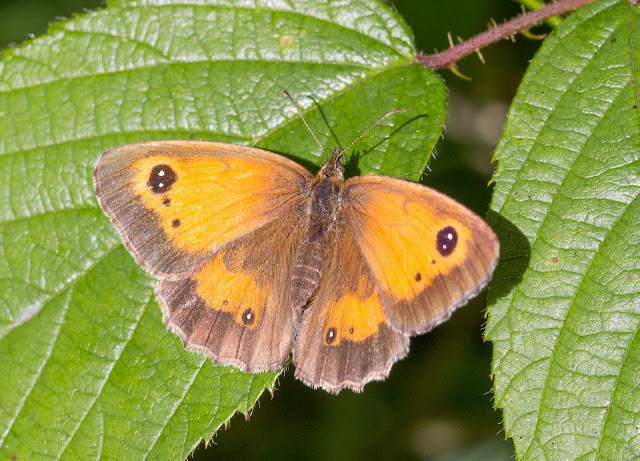 There was a number of Gatekeepers on the wing and they seemed to be everywhere you looked. I spent a while inspecting them and easily found a few of the Gatekeeper aberration excessa. 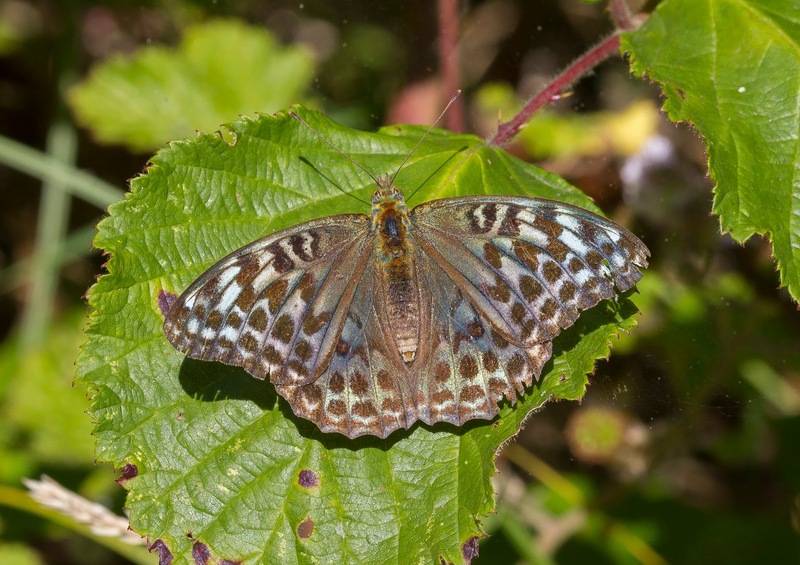 This aberration has extra spots leading down from the main forewing spot. 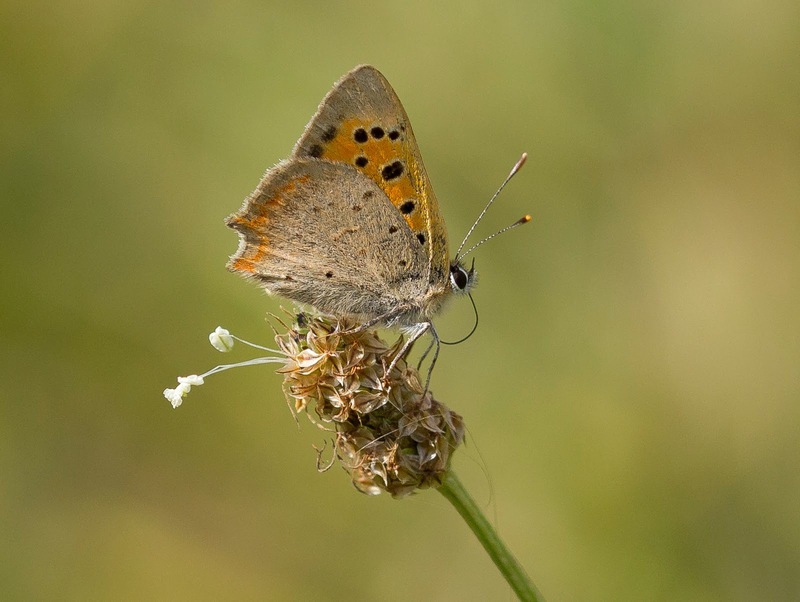 A tiny Small Copper whizzing around among the long grasses also added a nice distraction. 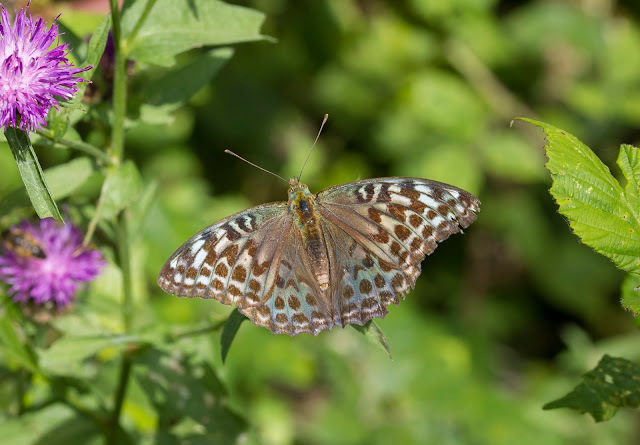 I was about to give up and head to Salcey when I finally saw a Fritillary glide down from the woodland edge and settle on a Bramble bush. There was my first Silver Washed Fritillary valezina in all it's glory busily feeding on a flower! I had spent many years admiring other peoples photos of these stunning butterflies online and to finally see one was quite a moment! The valezina is a variant form of the female Silver washed Fritillary where the orange on the wings is replaced by a beautiful greenish pearl effect. Unfortunately this pearl effect quickly wears off and as this butterfly had emerged while I was away on holiday it was now looking a bit ropey to say the least. I left the site glad to have finally seen one but a little disappointed it wasn't in better condition. Whilst I was at work the following week though amazing records started to come out of Bucknell Wood of up to five valezinas being seen in the same area I had been in at the weekend! There must have been some new emergence and as the weather was looking good on my next day off work I was joined by Simon Hales and we shot over there to have a look. No sooner had we arrived in the glade we found a valezina nectaring on a Bramble, and then we saw another and then yet another. We had three valezina feeding on the same bush right infront of us all in varying condition but one though, with the exception of a tiny notch in the wing, was pristine! 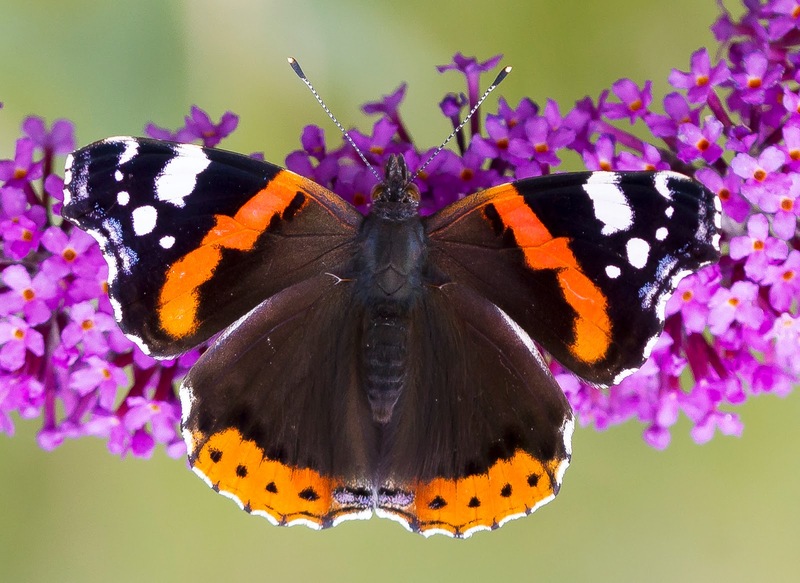 I have to admit, I've been lucky enough to see some magnificent butterflies abroad and here in the UK but this butterfly, as it twirled around in the bright sunshine, was one of the most beautiful things I have ever seen! The stunning colours changing from green to blue and then to bronze as the light reflected off the butterfly's wings was almost mesmerizing but it's something that you can't really recreate in a photo. Luckily I had the foresight to record this short video clip of it feeding. Play in fullscreen and the highest quality you can. I also spent a lot of time trying to get the underwing shot. The underside of this butterfly is a gorgeous green colour and it was quite a challenge to get as the heat of the late summer sun shone through the woodland canopy. I posted this picture on Facebook and someone commented on the Easter Island Statue's face on the forewing, ever since then I can't help but notice it! 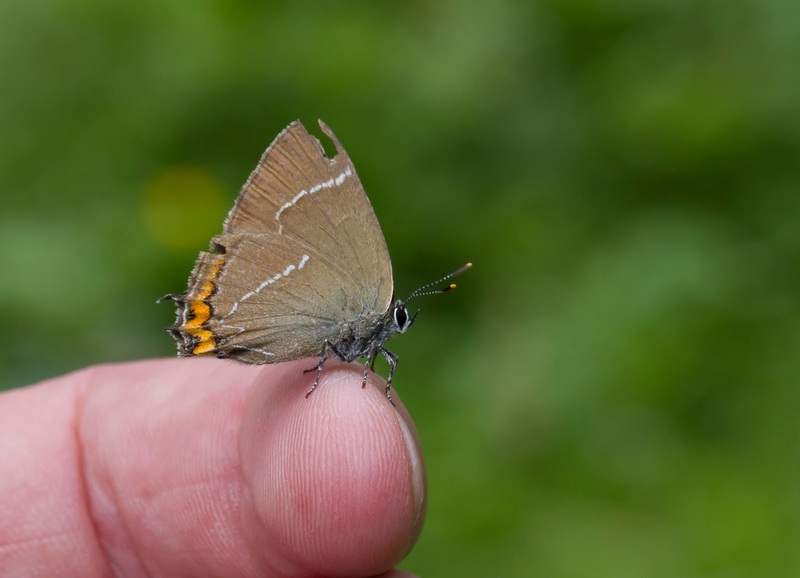 Even more luck headed our way during our afternoon visit as for a period of less than an hour a few Purple Hairstreaks seemed to like descending from the tree tops and onto the grasses by the paths. They really put on a show as they flew around our feet and before settling deep in the vegetation. Eventually on came down and started to feed on the honeydew on the low laying leaves of the Bramble bush. I slowly sneaked up on it and luckily got one of the best Purple Hairstreak photos I have ever taken. We left the site very happy with the day's sightings! I returned yet again a few days later in the week in order to try and get photographs of the Silver Washed Fritillary eggs. 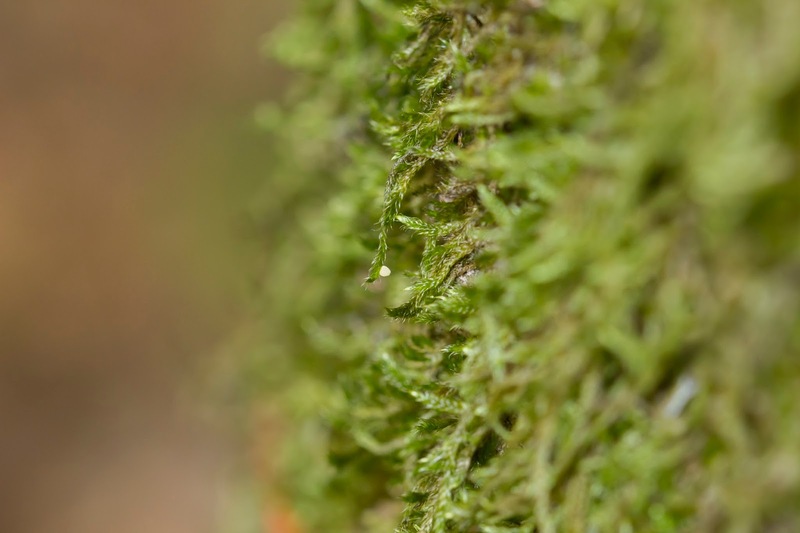 The area is so good they were very easy to find and several were found in a quick search of the moss on the trees by Violet patches. I've included a couple of shots, one macro pic to show the structure of the egg and another more distant one to show how small they are. It was great to pay a few visits to Bucknell even if I did have pangs of guilt for neglecting my local patch while I was there. The butterfly sightings were superb! 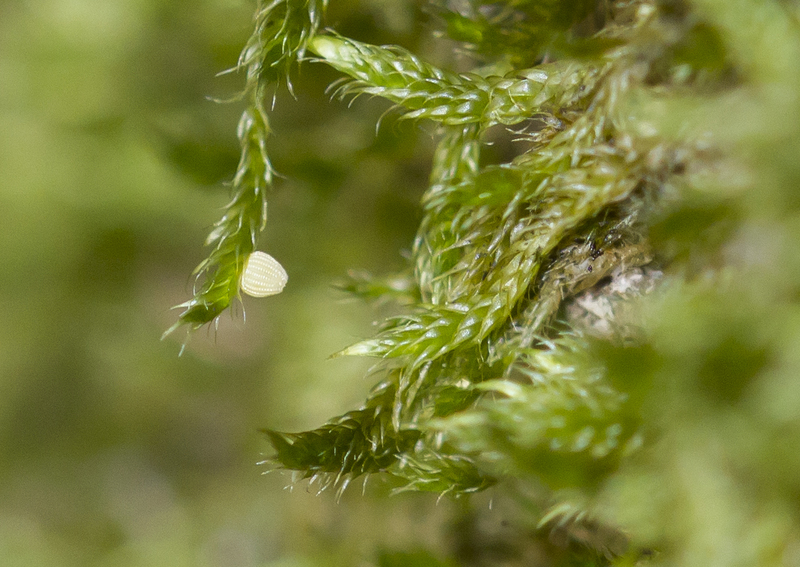 From now on though I'll keep searching in Salcey Forest and hopefully one day that beautiful greenish pearl will gentle glide through the forest and I would have finally found my own. Far be it for me to bore everyone with holiday snaps but my summer trip this year saw me heading off to Indonesia to see my wife's home country. The wildlife of the country is as staggering in it's beauty as it is in it's diversity and as I'm not an expert on Indonesian wildlife is you see any identification errors in the below pictures please get in touch and let me know! The holiday started with me, my wife Desica and my step kids Jessica and Oscar catching a flight from Gatwick to Istanbul and after a long wait (taken up with a few glasses of Efes while admiring the local Hooded Crows) we finally caught the flight to Jakarta. We arrived in Jakarta late in the day and headed straight for the hotel. My wife had planned the itinerary of the trip with military precision and it looked like it was going to be the trip of a lifetime and it started with a hotel room with quite possibly the most staggering of night time cityscapes I have ever seen! We then headed out to a bar to relax and as we sat in the beer garden I had my first interaction with the local wildlife. Having just got off the plane I hadn't counted on the mosquitos still being active at 2 in the morning and after being eaten alive while sinking several bottles of Bintang I made sure I was covered in repellent for the rest of the holiday! In the morning the view from the window was even more amazing and it was pretty incredible to open the curtains to be greeted by the view. We then went out to explore the city. Jakarta is an amazing place and is an incredibly live and vibrant city, unfortunately the same can't be said for the wildlife but then that's probably the same for any city. It does have a problem with pollution which no doubt explains the lake of birds but one this that was very much in evidence though were the Swiftlets and the large Eurasian Tree Sparrow population. It was quite a surprise when the first birds I saw where ones I can see quite easily at home and I though I was hearing things when I heard the chirping coming from the vegetation by the hotel. A couple of Spotted Turtle Doves were also huddled up on the top of one of the lamp posts. We spent a few days sight seeing around the city and my wife caught up with her old friends and I also made some new ones. My brother in law Ronang also joined which was a great surprise and his expert guidance as he showed me around the "real Jakarta" while my wife relaxed in the malls will never be forgotten. Soon though it was time for the next leg and this involved a flight to Yogyakarta. We arrived in Yogyakarta late in the afternoon and I could tell from the flight in that we were now in a much more rural location. Although Yogyakarta is a city it lacks the traffic and high rise buidlings of Jakarta itself and the air quality could be seen to be much clearer as we landed. At the airport we met our guide for the area, a very nice chap called Frans Henry and if you are visiting the area I can seriously recommend you look him up as his expertise is par none (you can find him here - http://dejongasia.com don't forget to ask for Frans!). We then went to meet my mother-in-law Sri Seoprapti and then popped to the hotel which once again looked stunning despite it being dark. After dinner me, Jessica and Oscar spent a bit of time exploring the place and trying to see wildlife at night. There were loads of Geckos up in the rafters of the walkways which we very comical to watch. Flying around by the pool was this special little butterfly. It's called a Common Evening Brown and it's bizarre as I only ever saw them at night when it was dark! It seems that they only come out in the evenings and this one was very settled on the sunbeds under the floodlights by the hotel's swimming pool. Also in the outflows of the swimming pools a number of Javanese Toads could be seen. It was becoming very apparent that even the common wildlife here has amazing markings! The following day as we went for breakfast I found myself in a garden that alive with wildlife! Lots of Eurasian Tree Sparrows could be seen on the walls and after a bit of working out I found out the birds in a distant tree were Javan Munia and Yellow Vented Bulbul. Unfortunately I didn't have much time to explore as we had to be ready to head to the first stop of the day so we were soon in a car heading to a cave in the Winosari region. We drove through lots of rice fields on the way and then headed up towards the cave itself. I must have been a right pain as I was asking to stop the car every few seconds when I saw something. En route Jessica managed to find this stunning Tiger Moth which I managed to get to pose on my finger for a photo. I also managed to get a pretty rubbish pic of a Long Tailed Shrike by the side of the road too. I'll be the first to admit that abseiling down into a cave really isn't my thing, especially when there is so much wildlife to enjoy on the surface! So I watched the rest of the family drop down into the hole and then I went exploring the area. A type of gliding lizard was creeping up a nearby tree. The place was also absolutely alive with butterflies but I knew that in this heat they would be very difficult to get stationary. To add to this I was using the bridge camera (Canon SX60) as it's a good all rounder but it doesn't have the versatility of my SLR (which I had left at home to safe weight but was now regretting!). 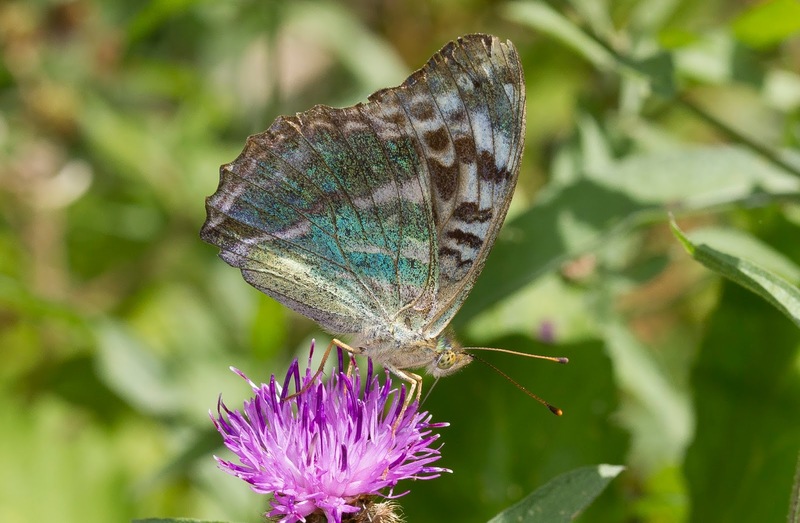 Frans offered to take me back down the road in the car and straight away we saw butterflies by the roadside so leapt out and and the chase began. After some perseverance I managed to get some shots of the many Common Yellow Grass flying around. 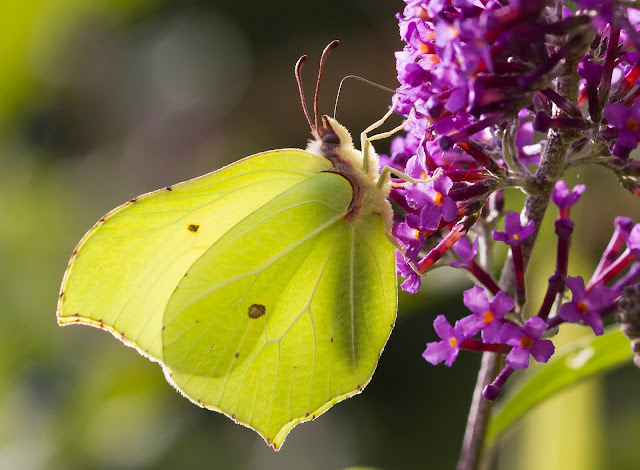 One of the hardest to get shots were of the Lemon Emigrants which are the Asian version of our Clouded Yellows. They're incredibly strong flyers and it was almost impossible to get a clear photo. Luckily I noticed a pair go into cop and I managed to keep up with them as they flew up into a bush. Me and Frans then returned back to the cave to wait for the others and I had no hesitation in now exploring the gardens nearby. Giant Asian Orange Tips were on some of the flowers but I never got a shot unfortunately. 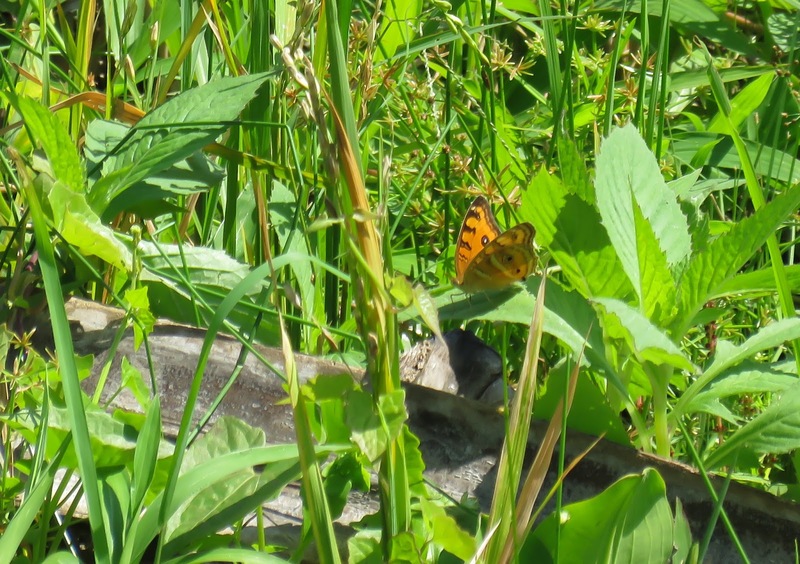 Then a butterfly really caught me attention as it flew from flower to flower. This butterfly turned out to be a Plain Tiger (a type of Monarch) and how I didn't sprain my ankle chasing it I'll never know. I wasn't prepared to let this go though so I chased and I chased! Eventually it settled for a while on a flower and I managed to get an ropey photo of it. After getting some shots I gave up the chase and returned to the area around the buildings. The mown grass also provided habitat for some interesting insects and this particular butterfly gave me a right headache with it's identification! 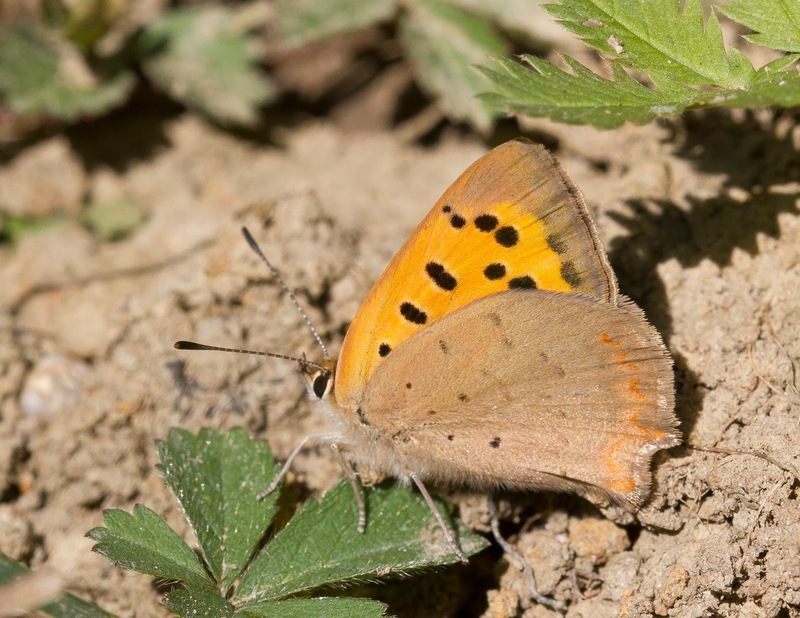 I'm pretty sure it's a Common Five Ring and is one of the Ypthima species of butterfly. I also found this unusual looking grasshopper on the road too, after a bit of searching it seems to be Attractomorpha crenulata (Vegetable Grasshopper). After the rest of the family returned from their cave adventure we sat and had some lunch in the shade and afterwards as we made our way to the car I noticed a dragonfly buzzing around the walls of a nearby building. Luckily it settled on the end of a branch and I managed to sneak up on it for a shot. We then returned back to the hotel and spent the rest of the evening exploring the city. The following morning I was up early and went for a walk round the hotel gardens before breakfast. Lots of Javan Munias were back in their tree and another Plain Tiger could be seen whirling around the tops of one of the trees. As I walked around exploring the bushes I noticed a small colony of Skippers and after taking a few shots and a quick internet search I found them out to be the Clouded Skipper. I also saw a small butterfly whirling around the base of some bushes round the corner and luckily it managed to stop so I could get a photo. This little stunner is one of the Cupids and of which I'm pretty sure this is the Plains Cupid. It took me a while to tear myself away from this stunning looking butterfly but it was time to meet the rest of the family for breakfast and then afterwards to meet up with Frans for our next venture. Our first stop was the incredible Prambanan Temple, the largest Hindu Temple in Indonesia. Now there is a little story to tell here as when I first arrived in Jakarta and saw the Tree Sparrows I searched for them on the internet and while doing so I kept seeing pictures of this stunning looking bird called the Javan Sparrow. It turns out that these Javan Sparrows are now rare and very difficult to see, so when Frans mentioned during one of our conversations that they had been seen at Parambanan Temple I got very excited. I'm not going to lie as impressive as the site is all I could think about was the possibility of seeing this rare bird and from the moment we got there I was scanning everything! Yellow Vented Bulbuls and Javan Munias were all over the place and as I looked up towards the tops of the building Swiftlets could be seen swirling round. I then glanced at a bird that looked a little different fly up the side of a building. "I'm sure that had grey on it" I was saying to myself and I searched and searched to try and relocate it. Suddenly there it appeared perched right on the top of a piece of ornate architecture was a male Javan Sparrow! We had an excellent guide showing us around and unfortunately the appearance of the Javan Sparrow happened right in the middle of one of his talks and I later felt the need to apologise to him for my reaction when I saw it. It was very distant but fortunately the long zoom of the SX60 allowed me to get a couple of record shots of the bird. We then carried on exploring the site with our guide but despite a lot of searching by me I never did glimpse the Javan Sparrow again. It turns out these Javan Sparrows are a bit of an enigma as this really isn't the sort of place they should be breeding. Approximately a decade ago there was an earthquake in the region and afterwards they were found to have relocated (they normally breed out in the rice fields) into one of the temple towers. It's such a mystery that one of the local universities is now conducting a long term ringing programme of the birds to try and understand why. The rest of the temple complex was a real joy to explore, not just for the amazing architecture and stunning carvings but the wildlife using the site was fantastic. Inside the tops of the tall towers Bats could be seen hanging and a very large Tokek (a large Gekko) was seen just above the doorway in one of the buidlings. The grounds of the temple also didn't disappoint and the short mown grasses of the slopes proved a haven for insects. There were Blues aplenty in one area but trying to get clear shots while it was so hot was a real challenge (it was so hot here the rubber armouring on my binoculars had started to melt!) but one really tiny one just had to be photographed so I spent ages chasing it. Eventually it settled on a flower and I managed to get a couple of shots. It turned out to be a butterfly called an Eastern Grass Jewel and despite it's tiny size it was a real stunner when seen close up. A nice looking dragonfly was also whizzing around the ruins in the grounds and it did seem a little more approachable than the butterflies. Since coming home I have searched and searched online to find out exactly what it is but the closest I have come to identifying it is as a Green Skimmer. If anyone reading this knows better please let me know. After our visit to Prambanan Temple we got in the car and headed to our next destination - the hotel in the grounds of the Buddhist Temple of Borobudur. We arrived here once again in the dark and after admiring a Tokek up in the rafters of the reception room we went to bed. We had to be up early the next day as we'd planned to be at the top of the temple for sunrise. It really was magical to see the sun come up between the hills in such a amazing place! The rest of the family went back to the hotel to have a nap after the early start but I decided to hand around. The whole place was coming alive while dawn was breaking and I also took the opportunity to take a few shots before the masses of people arrived to visit. There was quite a lot of activity in the trees around the temple with flocks of Javan Munias and the odd Grey Cheeked Green Pigeon. Back at the hotel though I found a fantastic spider. A single tree in the grounds was full of Medusa Spiders. I had spotted a male Medusa Spider the night before but now the sun was beaming lots of females had emerged and were hanging in their webs. They're a member of the Agriope genus of spider (cousins of the Wasp Spiders we get here in the UK) and they are staggeringly beautiful! They also have a nice diagonal stabilimentum running through the web. I spent a few hours relaxing outside the hotel room after this and it was nice to see the Javan Munias coming and going in the trees and hedgerows. I took this shaky video of one picking the seeds off a grass stem by my patio. All of a sudden I saw this enormous insect come flying into the hotel garden. I lept up to go and see what it was and as I did so it flew from the grass and onto a nearby tree. It turned out to be a Locust and it was the most impressive Grasshopper I'd ever seen, it had a very powerful jump and due to it's strong wings it could cover long distances when it flew so it was quite a challenge to keep up with. Luckily I got a couple of pics before it shot off into the hedgerows. It was then time to head to our next destination and we soon found ourselves on a Garuda Indonesia flight to Bali. I do enjoy flying and this flight was special due to the stunning sight of the volcano Mount Merapi poking up out of the clouds as we flew out of Yogyakarta airport. We arrived in Bali as it got dark and after meeting up with my sister in law Kitri we went to Menega Cafe for one of the finest seafood meals I've ever had and then for the long drive inland to the hotel in Ubud. The place we stayed in was superb! A nice little apartment block in the middle of the rice fields and simply by sitting on the balcony meant that you were surrounded by wildlife. We stayed in Ubud for a few days and I really did enjoy getting up at sunrise and seeing what could be seen from this balcony while sipping Jasmine Tea. Some of the most easily seen birds were the Scaly Breasted Munias that like to sit on the wires opposite the room. Also prevalent were numerous Spotted Doves around the whole area, in fact they were in every direction you looked and could be quite tame as they perched on the hotel walls. The constant sounds of their calls was actually quite soothing and when I play back the videos it was I remember most from the hotel. Other birds included the White Breasted Waterhens which lurked around in the long vegetation of the paddyfields but the best views came early in the morning before they left their roosts in the trees. As the sun got higher Herons and Egrets could be seen leaving the their roosts and a real highlight came as a small brown bird flying between the houses turned out to be a Cinnamon Bittern. Cattle Egrets and Javan Pond Herons came down to feed in the rice fields as the morning wore on and provided quite a show as they strutted about underneath me. Yellow Vented Bulbuls could also be seen working their way through the trees early in the morning, it was amazing to watch the area come alive as dawn broke in fact I think I could spend a whole two weeks just sitting on this balcony watching what flies by! Another fantastic little bird could be seen no doubt feeding young in the bush opposite the balcony. I'm pretty sure it's a female Olive-backed Sunbird. Interestingly I spent the whole trip trying to find Preying Mantis but failed, it was only when I returned back to the UK and played the video back of the Sunbird I noticed the insect it was mercilessly bashes against a branch was a Mantis! A few butterflies were flying about underneath in the undergrowth, the best photo I could manage though was this ropey long distance and very cropped shot of a Peacock Pansy butterfly. 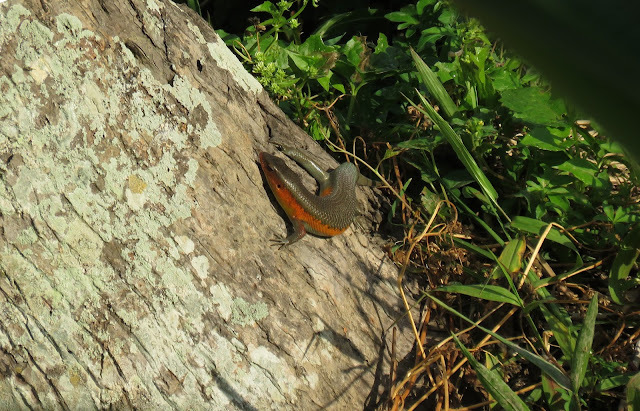 Also a Bali Skink could be seen sunning itself at the base of a nearby tree. The wires overhanging the nearby rice fields also provided a perch for a couple of Striated Swallows which were very busy feeding one morning and then they vanished no doubt to continue their migration. Another regular visitor to the balcony was a very impressive Jumping Spider but it was a complete nightmare to get a decent shot of with the bridge camera (not for the first time I was really missing the SLR!) but I persevered and got a couple of images. I also couldn't help taking a video as it kept attacking me when I got close up for a shot - you've got admire this little guys bravery!! The wildlife from the balcony wasn't restricted to the daytime though, in the evening the constant humming of the night time insects, frogs and reptiles could be heard. Cicak Geckos were always calling from the apartment walls and the amazing sound of the Tokek Gecko would occasionally be heard coming from nearby buildings. One evening while sitting on the balcony I was surprised to see a huge insect come shooting in obviously attracted to the lights. It turned out to be a Coconut Rhinoceros Beetle and after a bit of gentle persuasion I managed to get it onto my hand so I could get a shot showing the size of it. 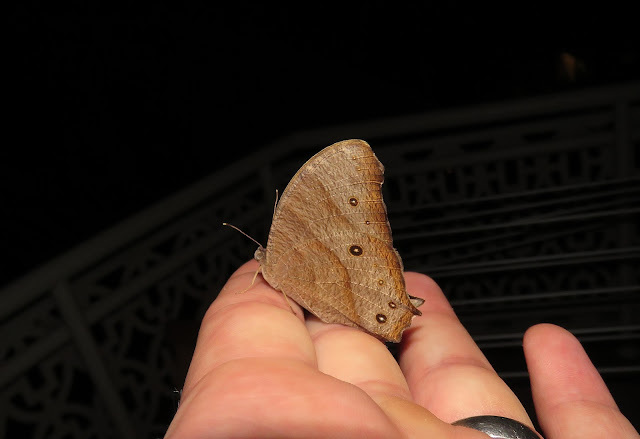 One evening I was also visited by a Common Evening Brown, I still can't get used to seeing butterflies at night! Ubud is famous for having the Monkey Forest and on one of our days in the area we couldn't help visiting and it's certainly an interesting place. The Monkey Forest is situated in an area of three Hindu Temples and was formed to follow the principle of Tri Hita Karana (Three ways to reach spiritual and physical well-being), the doctrine of this principle promotes harmonious relationshipes between humans and humans, humans and their environment, and humans and the supreme God. This principle has led to the forest surrounding the forest becoming protected and turned into a wildlife sanctuary with the population of Crab-eating Macaques (known locally as the Balinese Long-tailed Monkey) particularly benefiting from this. There are currently about 600 Macaques in the forest and when entering you are given the opportunity to buy small Bananas in order to feed them and it's certainly an experience I can recommend to anyone visiting Bali. It was in this forest where I saw my butterfly highlight of the whole trip too. White standing on a balcony overlooking the gorge in the middle of the forest I looked down and gliding through the light dappled valley bottom was a stunning Common Birdwing! There was no way I could get anywhere near it for a shot but the sighting was more than enough for me as I watched it powerfully glide through it's rainforest domain before disappearing into the vegetation. After a few days on Bali it was time to head to our next destination so it was back on a plane to fly to Jakarta. Once in Jakarta we had a long drive to the west coast of Java and to our hotel. Once again the hotel ground provided a haven for wildlife and lots of birds could be seen simply by relaxing on the balcony. A White-headed Munia provided a nice dash of colour one evening as it sat on top of it's tree! Also in the surrounding trees were a pair of very noisy White Collared Kingfishers and it was great to watch them flying in and out of the hotel's gardens. They never seemed to go far away and when they returned their presence was announced by their constant racket. One evening in a tree opposite the balcony we were visited by a very colourful bird. Unfortunately it happened late in the evening so the record shots I took were at very high ISO and to add to it they're also obscured by a branches but I thought I'd share them anyway. A stunning male Brown Throated Sunbird. Also down by the shoreline some were lot of Crabs on the rocks and they had some quite interesting markings. They took some sneaking up on as whenever they saw me with the camera they shot out of view incredibly quickly! During our stay here in the area we undertook one of those real trips of a lifetime. I had told my wife Desica in the past how I would like to visit Krakatoa one day and she had somehow managed to plan it into our holiday itinerary. So one morning we were picked up from the hotel and taken to a dock further up north. From here we jumped on board a small boat and we started the trip across the sea towards Krakatoa volcano. It took what seemed like a long time to get out there but then if you look at the map it is actually quite a long way! Soon enough the large looming shape of Krakatoa Island could be seen in the distance and as we got closer and closer the sheer scale of the area could be appreciated. In the below pic you can see the large triangular shape of Krakatoa Island on the left, Lang Island on the far right and the smoking vent of Anak Krakatoa in between them. 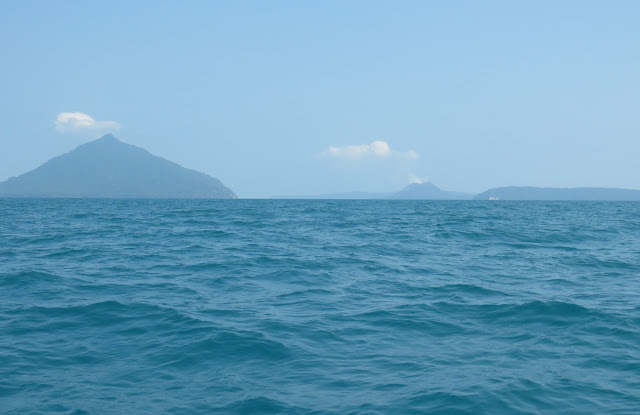 Krakatoa Island (left), Lang Island (right) and Anak Krakatoa in middle. When you look at the above picture you need to imagine that all the islands are joined up forming one huge volcano. In 1883 it had a cataclysmic eruption and it tore itself apart leaving three islands and a large empty hole in the middle. The sound of the eruption is regarded as the loudest sound ever heard and barograph recorders counted the explosion's shockwave several times over a period of days showing that it went around the globe three and a half times! Modern day volcanic activity is now centered on Anak Krakatoa which emerged from the sea and has been growing since 1930. As the boat swang round to the right it was clear that this was our first destination. It was quite imposing as the boat went in between the islands, not just because of the smoking vent of Anak Krakatoa infront of us, but due to the realisation that this huge area (approx 8 miles across!) was one massive volcano that literally blew itself apart. You just can't get your head around the kind of force that must have done that! As the boat got closer Anak Krakatoa made for a very impressive sight as we got nearer and nearer, it's not everyday you get to get so close to a volcanic vent spewing Sulphur and gasses out into the atmosphere. 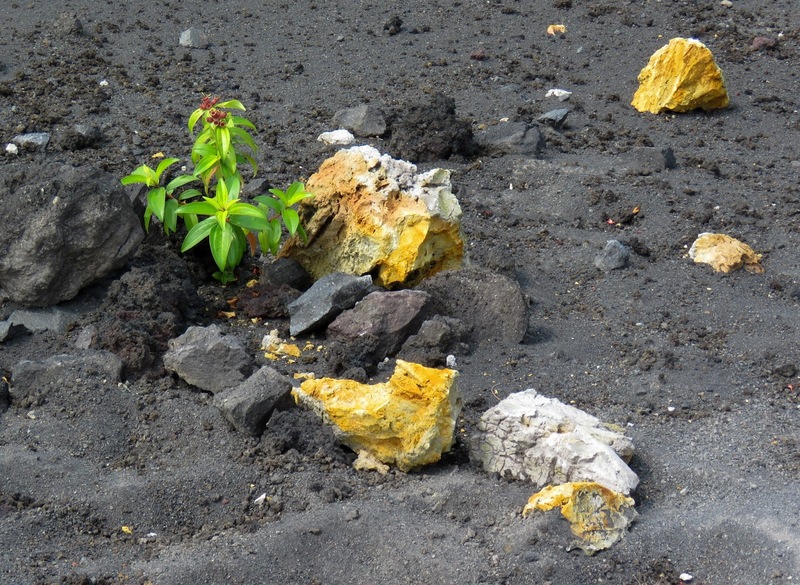 Soon enough we had landed on the black sand of Anak Krakatoa's shore and we started the trudge up through the small forest at the bottom of the slope. We had been told that Monitor Lizards were on the islands and it didn't take me long to see one but it certainly wasn't hanging around for a photo as it shot off into the undergrowth with impressive speed. As we neared the edge of the forest the black slopes could be seen rising to a plateau opposite the summit of the vent. The colours of the landscape provided some interesting contrasts as the bright greens of the tropical vegetation mixed with black rocks of previous volcanic activity and chunks of yellow Sulphur that had broken up where they had landed after being spat out of the vent. There was a surprising amount of birds around the islands too with Javan Munias in the trees and White Collared Kingfishers on the rocks by the shore. I know it's a bit sad but I couldn't help take a selfie at the ridge near the summit of Anak Krakatoa and shoot a panoramic video of the area too. Once we'd been up on Anak Krakatoa for a while it was time to return to the boat as the next step of the trip was to go snorkeling off Krakatoa Island. When we returned to the shore we hadn't previously realised how hot the sand was on the beach and we had to really run to get to the boat before the ground burnt our feet. An added bonus was had on the journey to the next island as I noticed a fin coming out of the water to our right and as I told the boat crew they stopped the boat and we waited to see what it was. 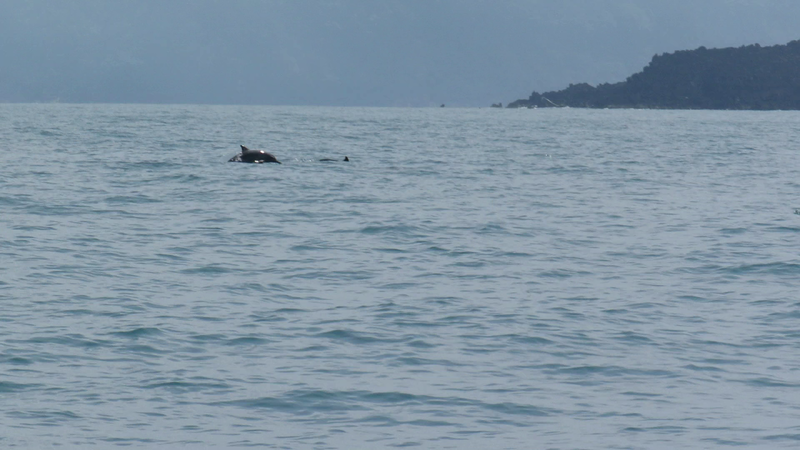 All of s sudden a pod of Dolphins breached and although they were distant the put on quite a show as they swam between the island. 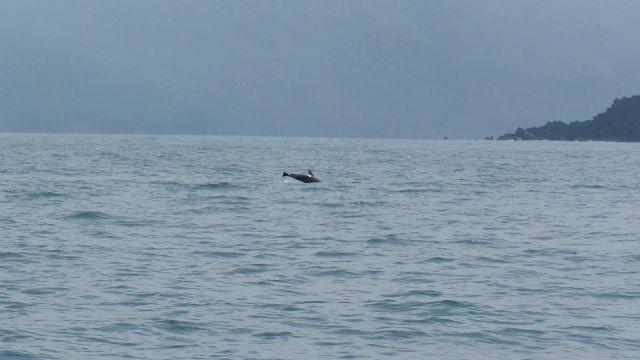 Despite bobbing up and down in the back of a boat I somehow managed to get this ropey video of grab of one breaching. We then carried on and arrived on Krakatoa Island. Very soon after we had been given our lunch of chicken and rice a Monitor Lizard with a keen noise could be seen walking through the undergrowth. It turns out these Monitors are quite common on the islands and they're not very shy if they can smell food! This one certainly wasn't anyway! I just had to put my lunch down a get a few shots and I was a little in awe at just how brave it was wandering through a load of people to pick up scraps of chicken........as far as this Lizard was concerned it was definitely the boss round here. After a very pleasant time snorkeling it was time for us to leave and as an added bonus when we got back to dry land we were rewarded with a few Coconuts. I drank one there and then and I took another back to hotel with me, where it was topped up with Rum and drank on the balcony while admiring the White Collared Kingfishers! Coconut topped up with a dash of Rum - delicious! It was then time to head to our final destination of the holiday. We took the long drive south and after an interesting journey we found ourselves on another dock opposite the island resort of Umang Island. A boat came and picked us up and we made our way over to a very rickety looking dock with an even ricketier looking causeway which led to our accomodation for the few days. It felt a little like arriving at the gates to Jurassic Park, but little did I know at the time though that the Jurassic Park analogy proved to be truer than I'd expected! When we arrived the rain was absolutely pouring it down but despite this while we were checking in Jessica and Oscar had run off on a little exploration but soon returned with news that they'd just seen a Monitor Lizard. Now I was still very pumped up from the Monitor Lizard we'd seen on Krakatoa but nothing could prepare me for what was instore on this island. Umang Island was full of Monitor Lizards, and I do mean full! You could see their tell tale tracks all over the sandy beaches, pathways and between the apartments. We'd arrived late in the day at the resort (by the way we were almost the only people there so pretty much had the place to ourselves) and so after a couple of drinks at the bar I went to bed. I couldn't wait to get up in the morning and see what was on the island so I crept up and headed out in the darkness to see the sunrise. My wife had the same idea and we stood their together watching the sun coming up over the fishing boats. My wife decided the best option after this was to go to bed but I stayed up and went for a walk. As the sun rose the island started to come alive. White Collared Kingfishers were calling in amongst the trees and Javan and Scaly Breasted Munias were in the bushes by the shoreline. A nice surprise came in the shape of a dark morph Pacific Reef Heron busily feeding in the surf. Also sitting at the top of one of the trees was an Olive Backed Sunbird making the most of the cool breeze before the sun got too hot. As sun rose in the sky the Monitor Lizards started appearing and soon enough they were all over the place. A particularly big one was strutting it's stuff along the pathway by the beach flicking it's tongue out as it went looking for food. I stood there in awe as this magnificent reptile walked towards me and I took this short video. They obviously reach the island by swimming and was interesting to watch them doing so in the sea. They are very capable swimmers and it's amazing how such a lumbering beast can be transformed into something so graceful in the water. One evening my wife and I had gone out for a walk and as we walked around a corner we found this big Monitor laying on the patio of an empty apartment. It was absolutely exhausted and from the amount of water beneath it I guess it must have had a long swim from the mainland. On the plus side it meant I got get a lot closer than normal before I had to dodge the tail as it whipped round - at which point I got the message and walked away. We also spent a day during our visit on a nearby island for more snorkeling. I really must get an underwater camera one day as the fish here (and at Krakatoa earlier) were superb but you'll just have to take my word for it. Luckily for me during one of our discussions with the guys running the boat the subject of me being into wildlife came up. This was great as whenever I was a passenger in the speedboat towing the Banana Boat behind he'd stop when we got close to some of the local birds. The many Shrimp boats were covered in what I'm pretty sure were Great Crested Terns and we got great views as we sailed close to them. Whilst on one of our speedboating sessions the guy controlling stopped suddenly and pointed up as a pale and dark morph Pacific Reef Herons drifted overhead. After a lot of fun we returned back to Umang Island itself and I had a long walk round as it got dark. It was unfortunately the end of my journey wildlife wise as the following day it was time to return to Jakarta for the final few days of the holiday and in doing so leave the amazing wildlife of Indonesia's rich countryside behind. On the bright side we were heading to Jakarta to celebrate my mother-in-laws 80th birthday and I was to meet some of the family I had never met before. But at the same time I must have looked a solemn figure as I walked along the beach looking at the Monitor Lizards tracks. I had learnt that Indonesia is a country of fantastic people, wildife, history and landscape. As I sat there in the growing darkness I was already forming the plans for my return..............I will definitely be back Indonesia!